Laguna Beach shops offer a wide variety of “green” garments for shoppers seeking to reduce their impact on the environment. “Reduce, reuse, recycle” has long been the mantra of environmentalists looking to lessen their carbon footprint. To follow this principle when it comes to clothing, thrift store shopping is the most obvious option—but not the only one. 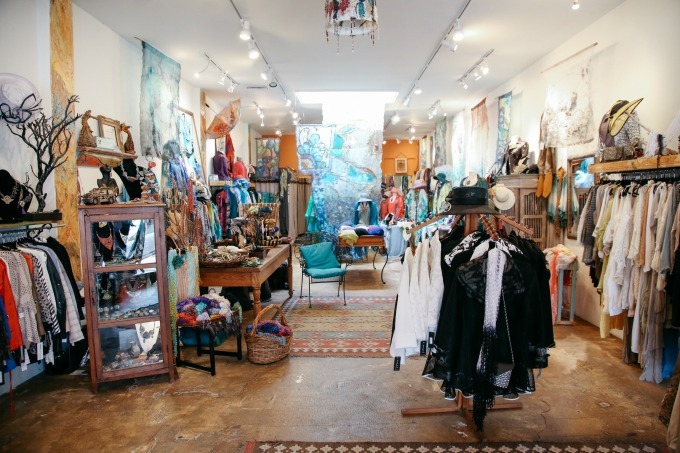 Several Laguna Beach retailers and local artists offer eco-friendly apparel that’s both fashionable and forward-thinking. 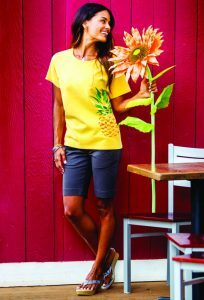 For example, Crazy Shirts recently introduced a line of fun T-shirts and twill shorts colored with the natural dye of pineapple juice for a sunny yellow hue. 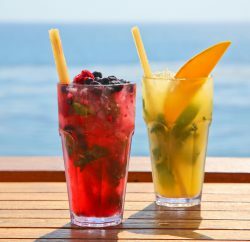 In years past, the Hawaii-based company—whose factory employs many sustainable practices—has utilized other natural, water-based specialty dyes ranging from volcanic ash to Kona coffee, chocolate, wine, lavender and ti leaf. Clothing sporting the latest juicy shade will become part of the brand’s permanent collection, available at all Crazy Shirts shops, including the Laguna location. And that’s just the start of environmentally minded options in town. Around the corner at Quiksilver, some customers may be wearing old water bottles and not even know it: Those recycled receptacles are shredded and turned into fabric, which is used to make the men’s Amphibian Shorts in a variety of colors and patterns. Similarly, boardshorts made from former drink containers are carried by Quiksilver as well as Crazy Shirts, and Hobie Surf Shop in the warmer seasons. Another brand giving new life to old materials, HippyTree’s Brigade Hybrid Shorts—composed of 72 percent recycled polyester—have been sold at Hobie, which also offers the Patagonia Down Shirt Jacket, featuring a shell made from 100 percent recycled polyester ripstop fabric. And the jacket is filled with feathers that can be traced to European geese that were never force-fed or live-plucked, making it the perfect choice for both environmentalists and animal lovers. For Hobie, carrying eco-friendly clothing was a conscious decision. 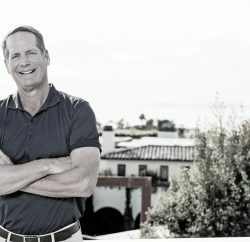 “My partner Mark Christy and I have always been stewards for the environment,” says Jake Schwaner, Hobie partner and general manager. “We both grew up that way with a fond appreciation for both the oceans and mountains. When sustainable materials became available for us to utilize with our product mix, it was pretty much a no-brainer. 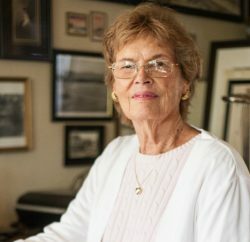 “We both share a vision of … [making] our stores into cultural hubs where the community can turn to for information on our surf culture and environmental initiatives.” In fact, Hobie’s green mentality goes far beyond the products it carries as the Laguna store was recognized by the California Green Business Program in 2015. Back in 2006, Hobie started sourcing and using sustainable materials when it came across a small company offering blank T-shirts, sweatshirts and hats made of organic cotton and recycled polyester. “These blanks were the ones that we were running some of our infamous Hobie shirts on,” Schwaner says. Then, in 2009, Hobie helped start a movement that aimed to inform and rally the action sports industry to support environmental efforts—“all with a common goal of finding better ways of educating the world about the dangers of global warming and the need for social responsibility,” Schwaner says. 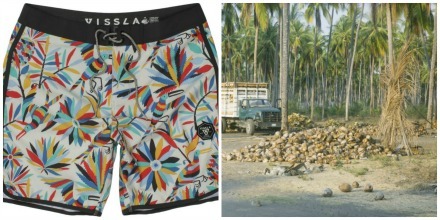 Vissla’s “upcycled” boardshorts are made using the fibrous outer husk of coconuts. Among its green garments, Hobie offers the Patagonia Better Sweater, made of polyester fleece that’s bluesign approved, referring to a system of textile manufacturing with strict criteria for reduced impact on the environment. The collared, zip-up sweater in Bleached Stone and Catalyst Blue utilizes a dyeing process that requires significantly less dye, energy and water than conventional methods. Hobie also sells HippyTree T-shirts made of organic cotton—grown without the use of pesticides, which add toxins to the environment—and has carried Vissla “upcycled” boardshorts, which convert items that are considered waste into something usable. The company uses an “activated carbon fabric” that blends Cocotex yarn, created from the fibrous outer husk of coconuts—keeping them out of the landfill—and Repreve recycled polyester yarn. The result is an odor-resistant, fast-drying material with natural elasticity that provides the flexibility needed in action sports apparel. Backwards Prints uses water-based ink to silk-screen creative prints by hand onto tank tops. 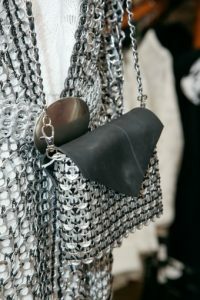 One line of purses and carry-alls available at the store starts with bags crafted from recycled black, rubber inner tubing accented with rows of the shiny, silver-colored pop tops for an almost biker-chic aesthetic. Another set of purses, by Escama Studio, a green and fair trade company dually based in San Francisco and Brazil, features an exterior made of pop tops with a fabric lining inside. These are handcrafted by artisan groups in Brazil using traditional crochet techniques. On another rack in the Duet store are jackets hewn from recycled leather. Two brands, Natto and Kushi, use leftover lambskin from Spain and the garments are assembled in Turkey, Venzal explains. One piece is covered with small circles of leather to create a modern pattern. For others, row after row of slits are cut into the sleeves for an almost fringe-like texture with a see-through quality. But Venzal didn’t set out to sell eco-friendly clothing. “It just happened to be like that,” he says. The shop owner searched for unique and fashionable items and many of his picks turned out to have that sustainable sensibility. Venzal is also an artist himself: The former exhibitor at Festival of Arts and Sawdust Art Festival creates hand-dyed cotton and silk scarves that he sells at Duet alongside the other clothing items and accessories—all wearable works of art—in his store. He also has made jackets out of hand-dyed antique damask tablecloths, napkins and bedspreads dating back to the early 1800s in Spain; although there are a few left to sell, Venzal hasn’t made any of these for a while because the heirloom silk linens are more difficult to come by these days. A bride’s family often gave these pieces as a dowry when she married, but as that’s no longer common practice, the remaining ones are few and far between, Venzal explains. Duet boutique sells fashionable and unique items that also tend to be eco-friendly. 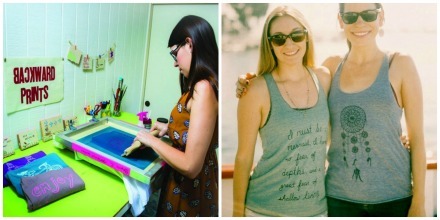 Another local artist, Brynne Cogorno, uses water-based inks to silk-screen her creative prints by hand onto T-shirts and tank tops—some of which are made of organic cotton. The Laguna resident sells these tops online, at the Buy Hand shop and at Sawdust Art Festival during the summer. Her business, Backward Prints, started in 2008 as a stationery line with wildflower seeds embedded in tree-free paper made of plant fibers and organic cotton, offering a biodegradable greeting card option that sprouts and blooms when planted in the garden. “It’s actually what got me into the eco-friendly field,” Cogorno says of the cards. 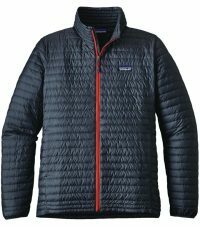 Patagonia’s Nano Puff Jacket’s insulation is made with 55-percent post-consumer recycled content. Available at Hobie Surf Shop. Her customers loved the designs, which she hand-carved into stamps for block printing, so she started making baby onesies with her pirate ship pattern. That expanded to women’s shirts and tanks with fun, whimsical graphics: mermaids, Native American dream catchers, inspirational quotes and the elephant-headed Hindu god Ganesh. For a while, she was using American Apparel’s organic cotton blank T-shirts as the base for her work, but the styles were limited, so she eventually switched to nonorganic options in order to provide necklines and silhouettes that were most popular with her customers. Cogorno says she considered buying other styles of organic cotton shirts from Thailand, but that would have increased the carbon footprint. Duet sells a stylish soda can pop-top purse. “The challenging part is finding blanks that are [made with] vegetable-based dyes or nonbleached organics,” Cogorno says. “… I wanted to make sure everything was upholding to certain standards.” Even with shirts that aren’t organic, the environmental impact is small—Cogorno silk-screens in her Laguna garage and reuses leftover ink. “I don’t put anything down the drain,” she says. “… I try to be very conscious of my waste.” And, for local buyers, the finished product doesn’t travel far (reducing fossil fuels needed for transportation). In fact, all of the blank shirts are manufactured in the United States rather than overseas, and the pieces for her children’s clothing—still organic cotton—are made in Los Angeles. Another bonus: The hangtags on her shirts are cut from biodegradable scraps of the seed paper used for her stationery, and she gives free canvas bags to customers who spend $50 or more, to reduce reliance on paper bags. When she does put items in paper bags, she reaches for those made of 60 percent recycled contents. Today, more and more stores in the area are working toward lessening their environmental impact, and becoming increasingly mindful about the materials and processes they use. 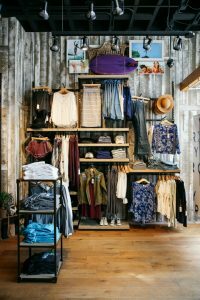 The result is many wardrobe options that put less stress on the environment than conventional clothing, and Laguna shops and brands that are helping locals become eco-chic without sacrificing style for sustainability.